*** We received the following Imaginista kit from the Orb Factory in order to facilitate this review. All photos contained below are copyright Momma Told Me Blog 2013. Momma Told Me: A little inspiration goes a long way. When I was a little girl I loved crafting. To be fair, Momma was a SAHM, and everything Momma did I wanted to be a part of. With her annual craft shows featuring over 10 original craft concepts each year, it was easy to see why having a daughter afoot could become problematic. The solution was a series of simple craft kits that not only encouraged me to hone my reading skills, via the directions, but kept me busy and feeling 'just like Mom' for several hours. The first time we took Sabrina to my childhood Mecca, Michaels, she feigned interest amid loud sighs and grumbles. We quite literally had to talk her into choosing a few projects; which quickly raised enthusiasm as Sabrina (11) realized that crafting was much more than old ladies crocheting and lifestyle painting. There were several aisles of kits geared towards girls, and even science exploration, from a Make-Your-Own-Lip-Gloss station to Glow In The Dark Sand Art and more. 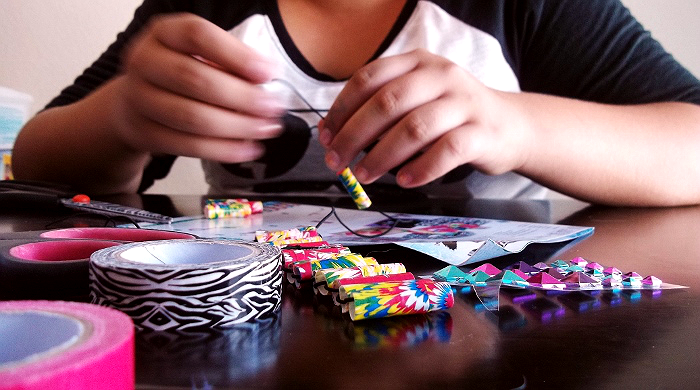 With the average age range being 6+ for such kid oriented craft kits, Sabrina (11) was the perfect age to self entertain with minimal adult interference; making for priceless Summer activities. Needless to say, Sabrina now gets excited about the very idea of a trip to the local craft store- we can't buy these kits fast enough. With the holidays approaching there are 2 great reasons to buy kid-styled craft kits and projects like the Orb Factory Imaginista line. Not only do these affordable kits have a retail less than $15, but they make great gifts for young girls and tweens. 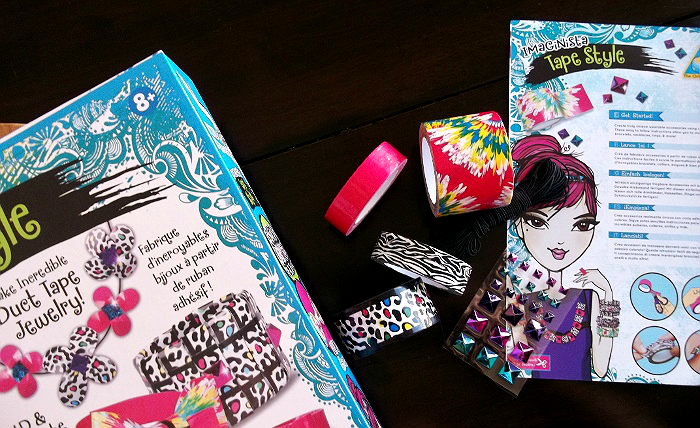 The Imaginista range of crafting kits focus on jewelry and accessories which provide materials, but teach techniques, so the end result is as varied as your daughters' personality. 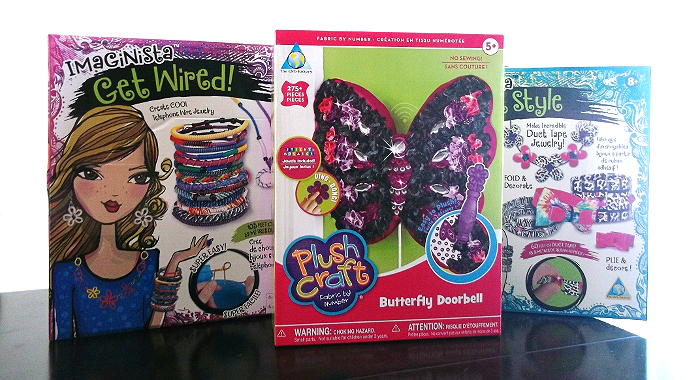 Spanning from Tie Dye Purses to Twist and Loop Jewelry, these craft kits are sold nationwide at Michaels, and online at Amazon. They also happen to be one of my top picks for beating the Winter Vacation Blues, and keeping children busy during hectic holiday preparation. Just be sure to buy one kit for each kid; you don't want fights breaking out over sharing materials- there's always one element (tie dye duck tape, purple beads, etc) children will fight over sharing. 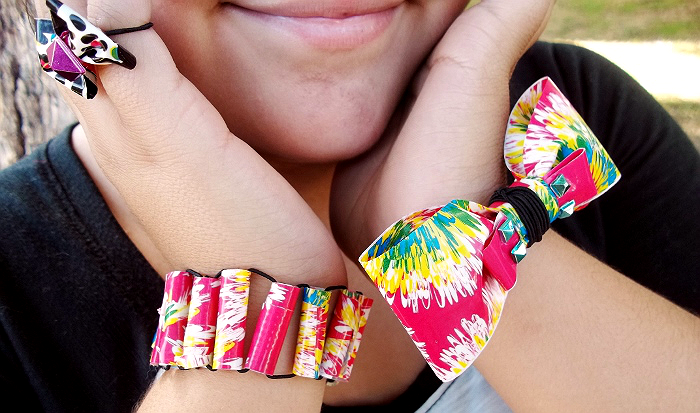 New to the Imaginista, by Orb Factory, Fashion Kits range of products is the Tape Style kit that teaches young fashionistas to make their own duck tape jewelry and accessories. When I was in high school, 10 years ago, the duck tape wallet trend was just returning. Today, duck tape accessories are hotter than ever; with the Duck Tape brand continually doubling their Prom Dress, Stuck At Prom, contest entries each year. 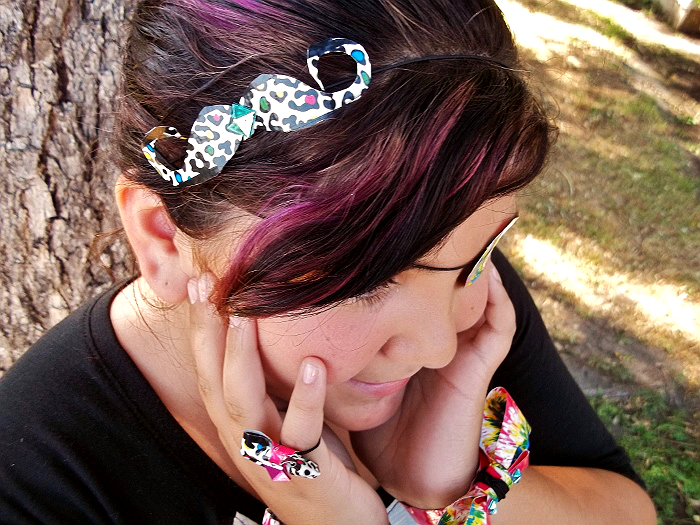 And, since most little girls love stickers, playing with colorful printed tape to make jewelry is very 'cool.' Sabrina's eyes went wide as soon as she laid hands on the Tape Style kit, and was even more excited to see the varying widths of zebra print, hot pink, and tie dye tapes inside. This particular kit offered techniques for additional materials not included in the kit (standard plastic straws) as well as plenty of step-by-step instructions for folding the tape into jewelry. Included was some elastic string for making bracelets, headbands, rings, and more, as well as 'gem' style sticky beads. We spent well over an hour experimenting with recreating the designs on the front of the Imaginista box, and even devised some of our own original pieces. Sabrina's obsessed with mustaches, go figure, right?, so I hand cut a curly mustache from the rainbow leopard tape and strung it onto a piece of the black elastic string to make a headband. We also had fun wrapping the tie dye tape around a straw to make hand cut 'beads,' and practicing the included instructions for tape bows. Sabrina was even inspired enough to make an 'eye patch' out of tape! Overall, this Imaginista kit was a big hit, and have plenty of product leftover for another crafting session on a later date- what a great deal! These kits are great for parents who want to inspire creativity in their kids with buddy style activities, or simply set their children loose to explore on their own. What Daughter Says: Unleash your child's creativity with easy to follow, complete, Imaginista craft kits. Those look like so much fun to do! 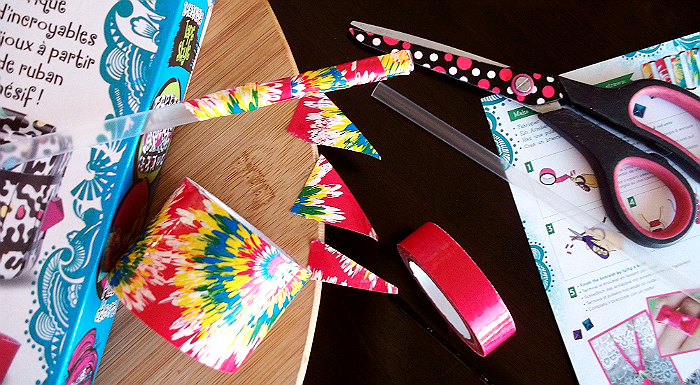 I remember doing a lot of crafts with my mom and those are some seriously cherished time! I can't wait until my daughter is older and we can do jewelry/fashion crafts like these with her. Those will be some awesome memories to make. What fun! I can't say that I understand the mustache thing but it does look adorable on her head. I love the bright colors and the bracelet is brilliant! Adorable ideas. We had one brand of tape that was too sticky to work with. This looks better. IMO, one one the best things about having a girl is doing crafts. Orb Factory is one of our fav brands! this makes me want to have a girl soo badly!! 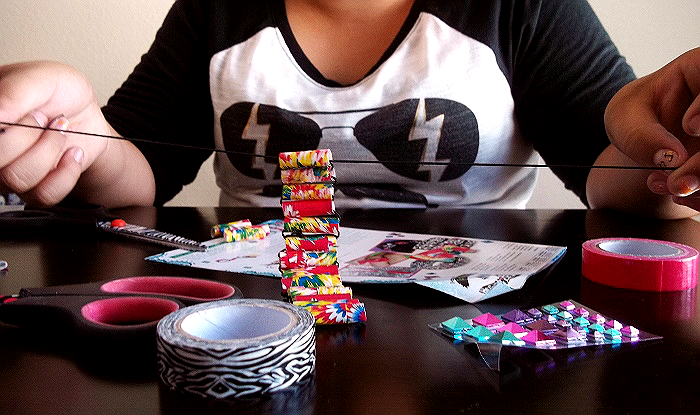 Obviously Sabrina has surrendered to the lure of Micheal's and their Duck tape craft supplies. After seeing your and her creations, who can blame her. I love Orb Factory products! My daughter loved their jewelry box last year and had a blast decorating it!